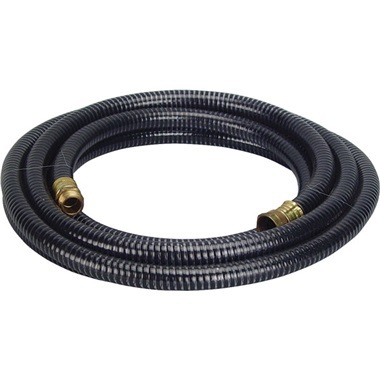 20 ft Extension Hose - provides additional length to cool the turbine air for a smoother finish or for increasing hose length. Recommended for use in warmer climate areas. Attaches to your existing turbine hose. 33 ft Replacement Turbine Hose - has vinyl hose guard at turbine end for extra protection and increased rigibility. Same as original. Both hoses are 3/4" ID reinforced PVC with internal helix for long life and durability. Hoses have male and female garden-style threaded ends. 20 ft Extension Hose -provides additional length to cool the turbine air for a smoother finish or for increasing hose length. Recommended for use in warmer climate areas. Attaches to your existing turbine hose. 33 ft Replacement Turbine Hose -has vinyl hose guard at turbine end for extra protection and increased rigibility. Same as original.